This pic is a follow up to one I previously posted. This is Mary Frances' block from a rr thru our RMCQ group. I didn't remember all her fur kids colors and she reminded me soooo, I stitched her up! Now the whole family of four leggeds is duly represented!! Hope you enjoy, MF!!! This is a second block that I got out for a round robin. This one is Under The Sea. I added the turtles and the crab motifs and the glass fish. I stil have a ton of work to do on the beach and dunes when it comes home, but look forward to seeing what the talented ladies come up with for this block! This is one of my more favorite forms of "quilting" as it were. Landscape quilting....but...that said, I think i'm finally figuring out my style in the more traditional cq block realm as evidenced in the previous entry. We'll see. I LOVE this art form and how it is always evolving and mutating as new skills are learned! Just sent this block off on a round robin! Can't wait to see what gets done! The white circle is the moon face I blogged about earlier....I plan on beading around it when it comes home...time just didn't allow for me to do all the stitching on this that I wanted to before mailing. Anywhoo...I really love the colors of this one. It was almost tough to let it go! LOL!!! This is a free standing lace motif done on my commercial embroidery machine. I can do this for anyone! ;-) I in turn, hand painted it and then stitched it down with hand dyed silk perle. Pic is hard to get cuz of the glittery fabric underneath, but the overall effect on this particular block is nice I think! This is the beginning of some motifs that i'm going to show everyone! I am in the throes of discovering whether or not there is any interest in the motifs that I make. I can make just about anything and will taylor fit to individuals tastes! I finally figured out how to make molds of things and this particular piece is now off on a rr block! I will be beading around her face to secure her when she gets back! This is another blog from the same round robin that i'm working on that I did a similar frame around the seams of the block. I read about this variation in a brazilian embroidery book and liked the effect! I then let this block sit while I explored the other possibilities. I really struggled with what to do here. I finally landed on a machine embroidered rose that I stitched in purples to blend in with the overall block. Then I stitched a brazilian butterfly and bee and put a bunch of french knots around the flowers to pull in some color. I haven't heard from the owner....i'm hoping she will enjoy the work that's been done. This is a pic of the work I did on a block for a round robin. The block itself was a bit challenging as it is a mix of patterned cottons, so it was interesting to figure out what to do and where to allow the work to show up! I started with a machine embroidered design of the iris' then added a vase, butterfly and bee with some french knots sprinkled around the flowers to tie things together. Looking at it now, I probably should have digitized the vase so it would at least be more symetrical! LOL!! Oh well, hopefully the owner will still enjoy the charm or its simplicity. The butterfly and bee are brazillian embroidery. I'm really enjoying working with the Edmar threads and the versatility of the designs. I then framed the block with a chain stich variation that created a frilly look by looping thread thru the chain stitch. The I used the fly stitch with french knots to create a table cloth effect to complete the look. Wow!!! I didn't realize I was sewwwwwwwwwwwwwwww far behind on posting! Awful!!!! 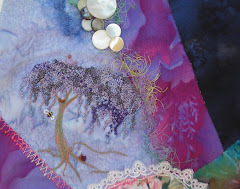 I have been busy tho and am going to download some pics of several round robin blocks I have been stitching on. On two of them I decided to supplement the designs with an embroidered motif from my commercial machine. I'm trying to redirect my embroidery biz and get more involved in providing motifs, quilt labels, etc. to the quilters of the world. Theres really a TON of possibilities here!! :_) I added french knots or other stitches around them to help the motifs blend in with the other hand stitching. Enough on explanation for now....off to load the pics and detail info there!